Popular in reality TV shows is the pixelate company logos of offensive images. You often see a person wearing a hat or tshirt where the logo is blurry. From time-to-time, a similar need might come to a photo taken with your iPhone. A license plate or someone in a window of a building that should not be there. Cloning or soft blur if you have the time is best, I’ll cover here shortly how best to do both of those. If your in a hurry though, a quick pixelation method is the app MosaicTouch. 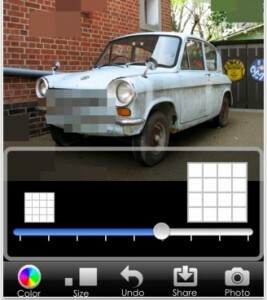 You can select an area with two fingers or just swipe across with one finger to apply the pixelating effect. To lessen the impact of the area, there are 18 base colors to choose from as well you can adjust the size of the pixels. MosaicTouch is quick, simple, and even lets you share directly out to Facebook, Twitter, Tumblr, email or save to your iPhone’s photo album. Fun to blur out friends at a party pictures too for a humorous ‘what stays in Vegas’ look.